LAGOS—THE intractable gridlock on Oshodi Apapa Expressway and Apapa-Ijora road will dominate the second quarter 2018 Town Hall Meeting, today in Apapa Amusement Park, Lagos State between Governor Akinwunmi Ambode of Lagos and residents as well as other stakeholders. The gridlock which has continued to cause untold hardship on residents, business owners, workers, motorists and other stakeholders has so far defiled all solutions as truck drivers continue to lock down Apapa and its environs crippling commercial and other activities. The 2012 Lagos State Traffic Law, signed by the then state Governor, Babatunde Fashola to restore sanity on the roads, apparently, has been jettisoned by law enforcement agents as reckless truck drivers now hold sway leading to a complete breakdown of law and order in the axis. The quarterly Town Hall Meetings, a forum with stakeholders in the state and often attended by notable personalities in the state. Since its inauguration in May 2015, it has become traditional for the state government to periodically render account of its stewardship as well as interact with Lagos residents on diverse issues of governance. The forum provides a steady platform for Lagos residents as well as other key stakeholders to be part of decision making process in the state. Governor Ambode as he pays official visit to Apapa, stakeholders expect him to come with practical solution to end the perennial traffic gridlock in Apapa and environs which is bleeding both federal and state governments revenue generation. He however gave a ray of hope that situation would soon be a thing of the past as government was already working out way to permanently end the traffic situation in the area. 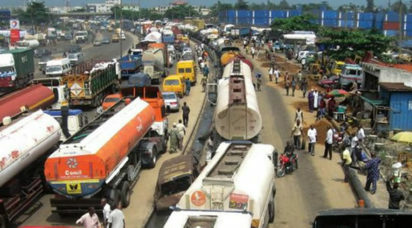 According to Musa, “We are not unaware of the terrible traffic situation in Apapa. Although, we have our men stationed there on a daily basis for traffic control, I must confess that the challenge is quite enormous. The situation is so unfortunate. The ports and tank farms have made the area a destination point for the influx of both tankers and containerised vehicles. “The present situation that the people are experiencing is made worse by the on-going construction of road on the corridor aimed at improving traffic when completed. The post Oshodi-Apapa road gridlock to dominate Lagos town hall talks appeared first on Vanguard News.